Earlier this year, on a sharp spring morning, we walked down the hill from Brede, stepped over the low fence at the side of the road and began following the river eastwards. Our goal was to find, and pay homage at, the grave of Terence Alan Patrick Sean - otherwise Spike - Milligan in the churchyard of St. Thomas the Martyr in Winchelsea. We made our way across the floor of the Brede Valley, the three of us hunched up against the bracing east wind, and talked of the nature of Milligan’s genius, his wartime connection with the area and – most importantly - which pub to lunch in. As we set of, we were unaware of the real feast that St. Thomas’s would provide: the legacy of Robert Douglas Strachan. We like walking, the three of us – two Andrews and an Austin; and if we can find a pub and the grave of someone heroic or inspiring at the end of it, all the better. The final resting places of Steptoe and Son actor Harry H. Corbett, the writer Malcolm Lowry and the spot on the River Ouse where Virginia Woolf took an unsuccessful paddle have all been the object of walks. But for now, there was a modest six miles in front of us and we only had Milligan on our minds. That was until we espied the dramatic form of Brede Place, the 14th century stone manor house that entered the literary history of East Sussex when it was rented by the American author of The Red Badge of Courage, Stephen Crane, in 1899. Joseph Conrad, Henry James, and H.G. Wells were regular guests of Crane until he suffered a massive lung haemorrhage. He did not die at Brede Place but went off instead to spend his final days at a German sanatorium. The legend that his ghost haunts Brede Place rather falls down on this point. Poking out from the still bare trees, however, the house did look forbidding enough for us to pull our coats about us, put our faces to the wind once more and hurry on. After the long snow-filled winter, to be out on the valley floor was invigorating; the tail-end of the lambing season standing as the perfect metaphor for the first walk of the year. The fields either side of the river were littered with ewes and their offspring and, apart from passing one farmer, we saw no other human beings until we came close to Winchelsea. As our path crossed and re-crossed the River Brede, the scene was positively a pastoral idyll worthy of Clare or Hardy. At one point, our way crossed the Ashford and Hastings branch line at track level. There was little danger: the line’s 150 year-old, 26 miles survived Beeching but, apart from an hourly fast service between Ashford International and Brighton, only three local trains run each day. We scuttled across all the same. As we neared Winchelsea, the view of St. Mary’s church tower, atop the hill in Rye, rose splendidly in the distance. This was put into sharp relief by a glimpse of Little Cheyne Court wind farm near Camber, on the other side of Rye. With twenty-six, 380 feet high turbines, National Wind Power’s scheme has been controversial. But the slowly rotating blades and the dumb magnificence of the towers cast an image of terrible beauty across the Sussex spring landscape. Once in Winchelsea, we climbed Ferry Hill and passed the remains of one of the medieval town gates. We marvelled at the architecture and the tranquillity of the place. Then we went to the pub. The New Inn in German Street afforded us simple food quickly and a restorative pint of Abbot Ale. Tempting as it was to stay in a welcoming bar after a six-mile walk, we needed to complete the business of the day across the road in the churchyard. 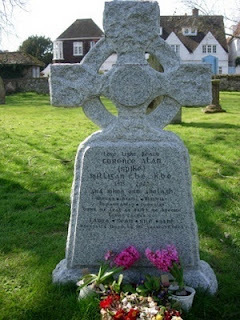 Spike Milligan famously wished to have the inscription ‘I told you I was ill’ on his gravestone. This questionably caused the church authorities some consternation and a compromise in Gaelic (duirt me leat go raibh me breoite) means that the immediacy of the joke is lost in the churchyard; but legends are always preferable to the actuality. Austin gave a reading of one of Milligan’s most famous poems, I Must Go Down To The Sea Again. We were suitably moved. St. Thomas’s has a strange duality of appearance: both preservation and decay. The chancel and side chapels that make up the body of the church are flanked by two ruined transepts. Also visible are the remains of supporting piers of what was thought to be a large central tower; the church was originally the size of a small cathedral. When we stumbled inside from the bright April sunlight our eyes had no need or time to adjust to the gloom. Brilliantly illuminated within, were what our outdoor circuit of the church had given no clue to: the stained glass windows of Douglas Strachan. A Scot, Strachan’s 20th century stained glass windows in St. Thomas’s are memorials to the dead of the Great War and the Rye Harbour lifeboat crew who perished in 1928. Strachan’s work at the church was completed in the twenties and thirties and he was interested in the modernist art of the time. Needless to say, purists are not fans. Shades of his enthusiasm for Futurism and Cubism are apparent, particularly in the disturbing War Memorial triptych. Taking up the windows in the north wall, they represent Land, Air and Fire, and Sea. All of his windows are a marvel and we stood, oscillating wildly, taking in the detail and vibrancy of each one. This was the crowning glory of the day and, if you are ever anywhere near Winchelsea, I urge you to skive off from what you should be doing and spend half an hour in St. Thomas’s. In fact, make a day of it: walk along the Brede Valley floor; wander past Brede Place; watch Rye rise before you; do it before it snows. Most importantly, spend some time with the legacy of Robert Douglas Strachan.